SIX TECHNOLOGIES; including stronger far infrared & magnetics, are sequenced with carbons and KDF for structuring, energizing, chlorine and metal reduction, and powerful water flow. Provides an average 12-15 months of superior bathing and showering per cartridge. A strong water flow with no need to back wash. Excellent for travel as well. The eWater Revitalizing Shower Filter provides the potential of greater pleasure and peace of mind for you and the children. Combines all the resources found in Nature to structure and energize the now "dead" water coming into most homes today. First, by reducing your exposure to chlorine & chloramines, and the absorption and inhalation of chlorine, chemicals and their potentially harmful byproducts, the Revitalizing Shower Filter visibly supports and promotes healthier, softer hydrated skin and hair. Using unique flow dynamics combined with two carbons and Redox media, it promotes reduction of chemical, lead and biological exposure, while extending carbon life. Strong magnetics interacting with powerful far infrared and magnetic field enhancers promotes and supports the natural restructuring, energizing and detoxing abilities of water as if it were allowed to flow down rivers and streams, as found in nature. The result promotes a unique, healthier shower experience. Simple and easy to install, excellent for travel, promotes and supports beautiful hair, healthier, softer looking skin, and when possible a lovely bath experience. Fill your tub through your Revitalizing Shower Filter should you have a shower/bathtub combination. The 12-18 month filter replacement module is a simple five minute procedure, assuring years of affordable pleasure. Try any other shower filter design on the market. Then experience the naturally enhanced benefits of your eWater Revitalizing Shower Filter. One shower and you will immediately know and feel the difference. 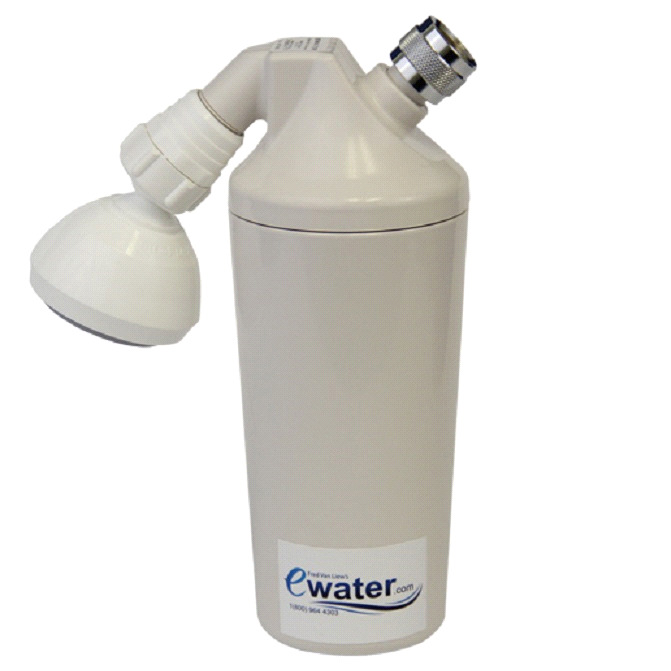 The eWater Revitalizing Shower Filter allows you to use the excellent soaking shower head from Siroflex of Italy. Other shower heads or wands may damage the unit and void any warranty. Very easy to replace every 12-15 months on average. With each E Shower Filter, you receive the best money-back guarantee in the industry.